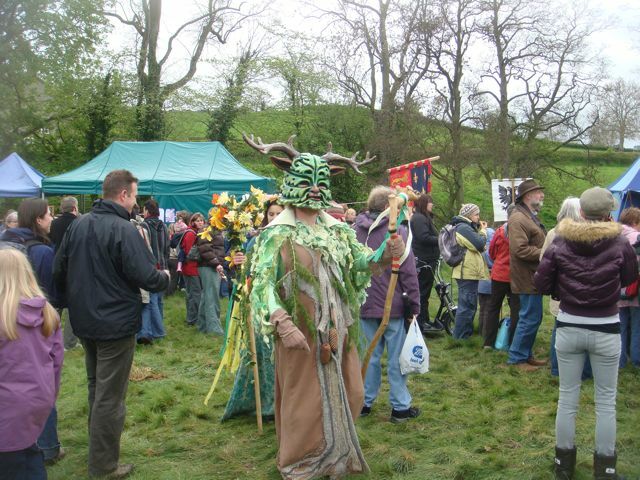 We fancied a day out on Bank Holiday Monday and whilst looking for things to do in South Shropshire, we spotted that the Green Man Festival was on in Clun all weekend. Clun is right in deepest South West Shropshire and not the easiest place to get to, but the countryside is absolutely beautiful in that area. We drove down, thoroughly enjoying the drive and had a great time at the festival. Lots to see and do and the whole town had really made an effort to welcome all the visitors. On the way home, we thought we’d take an even more scenic route home via the Stiperstones – and a couple of caches of course! The first was on a hill just to the north of Clun. Try as I might I could not find it. There was a very obvious place it must have been but I just could not see it. I doubt it’s been muggled as it’s a remote spot but you never know. Next on the list was two of thefortytwa’s more remote caches, to the west of Bishops Castle. The lanes round here are really narrow and some are almost like farm tracks. Great fun in the Jeep though! Both were easy finds with some stunning views as they were both on the top of hills overlooking the whole area. The first one was on Offa’s Dyke – we never realised this extended into England but it does! After stopping at the old Snailbeach Lead Mines near the Stiperstones so Freya could look for quartz crystals amongst the old mine debris, we did a quick nano on the way into Minsterley. From there it was a quick trip to home along main roads.